Sarah Griffin is a medieval art historian interested in the use of museum collections for teaching, which she investigates as a Research Assistant for ‘Cabinet’ and as a Junior Teaching Fellow at the Ashmolean Museum. Sarah works with Kathryn Eccles (PI) and Jamie Cameron on Cabinet, an interactive online platform designed to support and encourage object-based learning with museum collections. 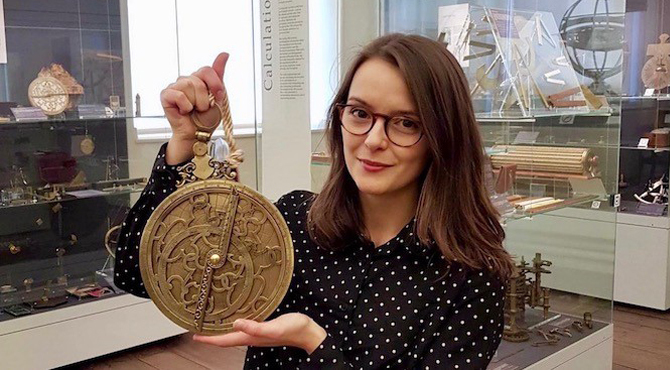 She has also been a Junior Teaching Fellow at the Ashmolean Museum since November 2017 for Krasis: an award-winning teaching initiative run by the Mellon-funded Oxford University Engagement Partnership, which uses University collections (such as this 16th-century astronomical device), to teach interdisciplinary undergraduate seminars. She has worked with heritage and museums throughout her education, including a Graduate Curatorial Internship at the Metropolitan Museum of Art, and as a researcher for ‘Coventry: Medieval City of Culture’: a TORCH-funded project with Coventry City of Culture Trust, Medieval Coventry Trust and the Historic Coventry Trust to uncover the hidden fragments of Coventry’s medieval past. Sarah completed her doctoral thesis, ‘Diagram and Dimension: The Visualisation of Time in the Drawings of Opicinus de Canistris (1296-c.1352)’ at Oxford’s Art History Department in August 2018. To hear more about her research on Opicinus, you can listen to her interview with the Uncommon Knowledge Podcast (Oxford). Her most recent work uses an interdisciplinary analysis of medieval time-keeping objects and images to re-evaluate how time was understood in the Middle Ages. To investigate this, she has been awarded a Dibner Fellowship in the History of Science and Technology at the Huntington Library, California, a Studentship at the Vittore Branca Centre, Venice, a Stiftung Preussischer Kulturbesitz Research Grant, to be taken at the Staatsbibliothek zu Berlin in Summer 2019, and a Durham Residential Research Library Visiting Fellowship. As an art historian working at the OII, she is interested in the use of digital tools for Humanities research. In 2018, she collaborated with mathematician Florian Klimm to investigate how network science can reveal new insights concerning the constitution of museum collections. Their paper, delivered at the latest PastNet conference, will be published in The Oxford Handbook of Archaeological Network Research (2021). GRIFFIN, S. (2019) "Synchronising the Hours: A Fifteenth-Century Wooden Volvelle from the Basilica of San Zeno, Verona", Journal of the Warburg and Courtauld Institutes. LXXXI 35-69. GRIFFIN, S. (2019) "Review: Worlds Within: Opening the Medieval Shrine Madonna", Journal of the British Archaeological Association. Maney Publishing. 171 184-186.